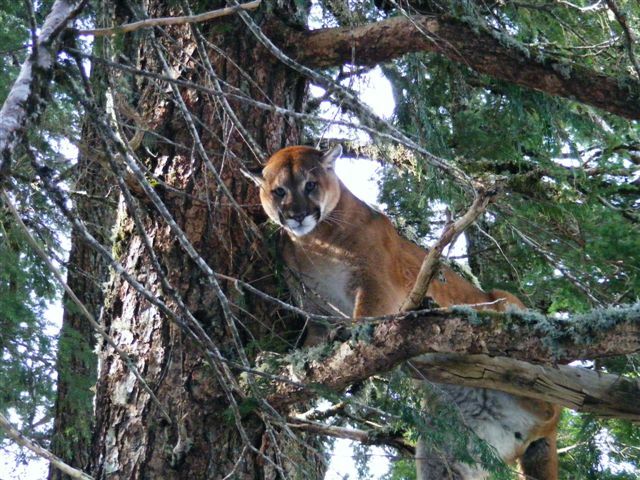 Vancouver Island, just off the West Coast of British Columbia, Canada, has the highest concentration of cougars (mountain Lions) in North America. The number is so high that a hunter may choose to harvest two cougars per season. Canadian Guides & Outfitters schedule their cougar hunting trips to take place during the winter months, when there is fresh snow on the ground or cold, dry conditions. This maximizes the opportunities for a successful cougar hunt. Because weather plays an important role in a successful mountain lion hunt we prefer to book hunts "on call". This means when favorable cougar hunting weather and conditions are predicted we will call, giving you some notice as to an arrival date. We understand this option is not available for many guests due to work schedules etc, so those that can not book "on call" may book a scheduled date with us during the weeks we most likely have good snow conditions. Our experienced guides and yourself will hunt using a mix of 4x4's, snowmobiles and our specialized tracked ATV's to find and hunt the cats. When a large fresh track has been located a pack of hounds will be released to track and tree the cougar. You can expect to see numerous different cougar tracks during your hunt. Mountain Lion hunting trips are seven days long and accommodation will be in our comfortable private lodge.